So I have a confession to make. Okay, so ever since this crazy cold weather rolled around I've been seriously thinking ahead to warmer months. Sundresses, open toed shoes, shedding this Winter coat of mine? Yeah, all of that is sounding pretty darn good right at the moment. And so what better color palette to share on this cold and rainy day than this happy, sunny palette. I've long been a fan of this palette of orange and gray. And I'm hoping you can see? Variations of orange pair effortlessly with the cool gray in a very beautiful and balanced way, I think. And these dresses? Nothing says Spring quite like floral prints and big happy blooms. And although these dress styles are from a few years back, it's definitely a look that I wish we'd see more of. And those romantic ribbon ties on the back of those chairs? Yeah, those had me at hello. So what do you think? Is anyone else liking these Spring inspired colors? 10 Comments " Color Story | Orange + Gray "
Pretty combination - that cake is lovely! I'm completely in agreement - I'm already craving warm spring colors. Wonderful orange elements here - especially the ranunculus on the cake! Since the announcement of the giveaway winner I still haven't herd from the Little Borrowed Dress. I love these colors. Her dress is gorgeous! The palette really is sophisticated and contemporary. 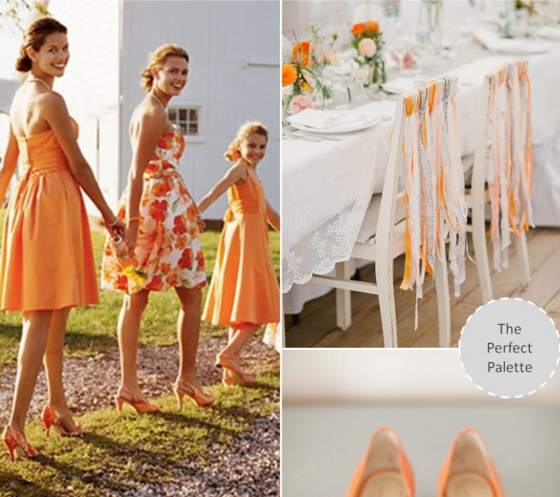 I love any color palette that includes gray, but the combination with orange is very spring, it makes nostalgic and excited for the upcoming seasons! This is such a happy board! Love the sherbet hues! Lovely color. It gives a feeling of warmth and coziness. I totally love it.